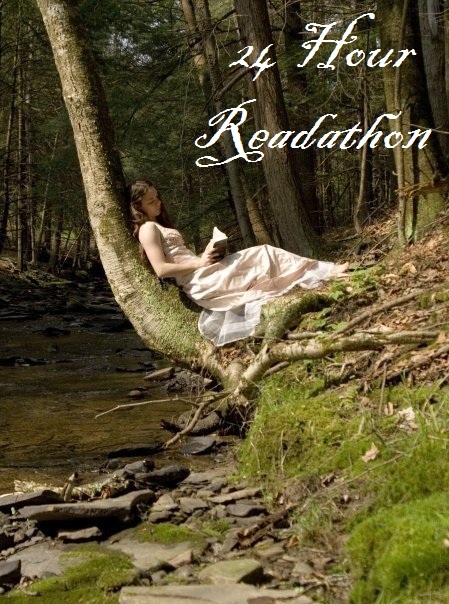 A Literary Odyssey: Readathon Start. I made sure I went to bed at a decent time last night so that I could be up nice and early for the readathon this morning. Unfortunately, I have to work an 8-hour shift this afternoon/evening at the park, so I'm not going to be able to be online all afternoon like I wanted to. But, since it is cold and kinda icky out, I'm sure we won't have too much to do. I can probably sneak in some reading and tweeting if that's the case. :) But if I don't update for a few hours, that's why. I am only planning on reading two titles today. I am kick-starting my morning by reading a fun YA title that I just picked up. I decided to read Pandemonium by Lauren Oliver since I enjoyed Delirium when I read it last year (not my favorite, but I enjoyed it well enough to read the second in the trilogy). When I finish, I will be spending the rest of the day reading Clarissa. I am still hopelessly behind, and while I really enjoy it, the book kills my hands when I read it. There is something about propping it open that just kills after about 30 minutes. I have been eying a play on my shelf (Lillian Hellman's Little Foxes), so I might even read that at work as something fast and easy to fly through. I fared a lot better in October by allowing myself to read whatever sucked me in, so while I say these are my plans, I am leaving my options open. Anyway, time to go brew a little pot of tea and settle in with Pandemonium. I am hoping I can finish it before I have to be at work at noon (work is only a 5 minute drive, so I hope I can make it). Good luck-I'll check in before I leave for work! A few hours of reading is better than none! I'm brewing my tea right now as well, caffeine is always essential in the morning (at least for me) and even more so for a read-a-thon. Have fun with your reading today!